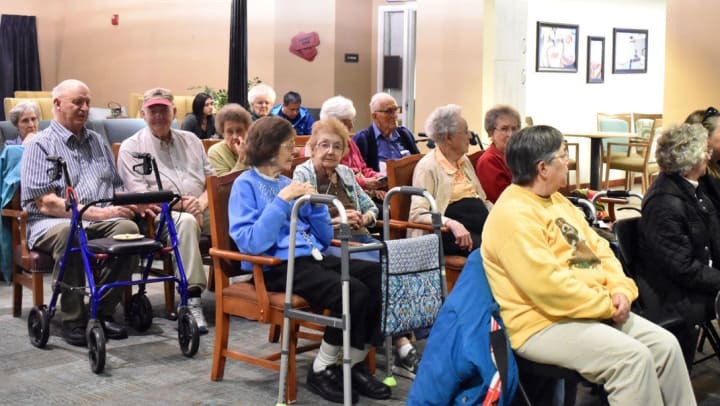 Residents of The Heritage at Meridian Gardens took a tour through history on Thursday, thanks to area students who attend school at home. “It is a good activity for homeschoolers to be able to get out and present something to other people outside of their home,” said Jessie Penn, mother of three participants at the fair. Organized by a group of families, the fair provides homeschoolers from pre-school to high school the opportunity to socialize and meet new people. It's the the third year The Heritage has hosted the event. Cindy Gasper, life enrichment coordinator at The Heritage at Meridian Gardens, said the fair benefits the residents because they are able to have the company of children while learning facts of history. It is both educational and entertaining for them. The monthly special events enhance the daily activities residents enjoy at The Heritage. Students presented topics they had researched and were particularly passionate about. Maia Velecela, 13, is a big fan of art and an artist, chose Leonardo Da Vinci, whose painting, “Mona Lisa” is one of the most famous of all time. From the history of the Old Testament travel to the history of space travel, the 100 residents enjoyed the students' presentations. Mary Middendorf, organizer of the fair and mother of four presenters, reviewed each topic before the fair to avoid duplications. Sixth graders Jesse and Jack Person, and Braiten Beck, presented the history of medieval weapons. Along with their displays, they had models of medieval weapons such as a sword, a trebuchet and a ballista. Next year, he plans to do a presentation on the history of firearms. Students set up their displays at their allocated booths and provided snacks. The residents then walked through the different booths with the students present to give a brief summary of their projects and to answer any questions. Residents recognized the amount of time and effort that was put in by each student. “They’ve had to put some thought and research into their projects,” Gasper said. Penn said her three children spent a number of months studying and researching their topics. An hour later, the residents gathered at the center of the lobby to watch individual and group presentations. During the presentation, some students had props like swords and arrows while some were dressed in costumes. Residents showed their appreciation to the students. For the next few days, the presentations will "the buzz" of The Heritage, Gasper said.